Last year I saw a photo of two blokes who were conducting a fauna survey in Queensland in 1978. One is wearing a shirt with the sleeves rolled up and a pair of ‘stubbies’ (very short shorts for the more youthful and urbane among you). The other is also wearing stubbies, and nothing else other than (possibly) underwear. He is either bare-footed or in thongs. The grass makes this difficult to ascertain but he is certainly not wearing shoes or boots. Neither wears a hat and one carries a rifle and a bag slung over his shoulder. This bag may contain water, a first aid kit and other items for their safety. But I doubt it. This photograph resonates with me as I put out my first Elliot trap as part of a fauna survey circa 1978, although I wore a shirt to cover my less-than-manly chest and didn’t carry a firearm. 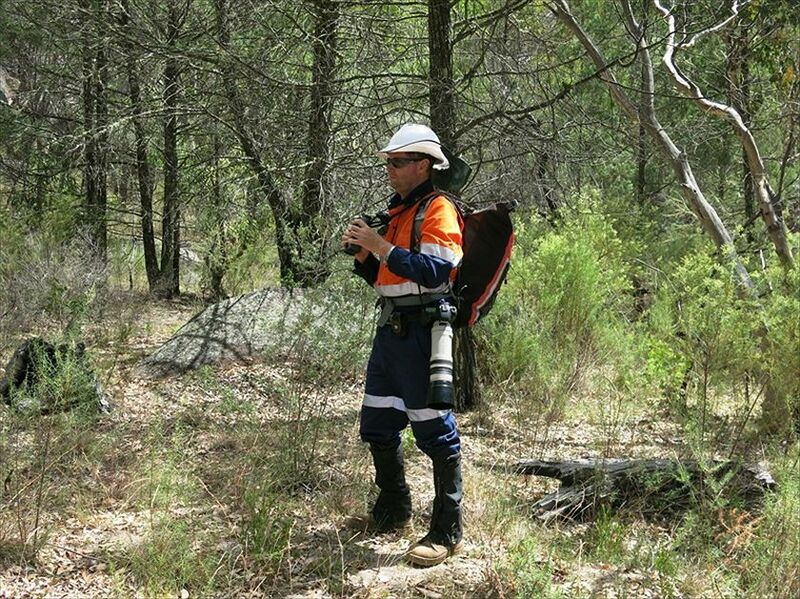 I continue to conduct fauna surveys, mostly when I work as a consultant and hence often for mining or coal-seam gas companies (yes, I do sleep at night). But how I long for those halcyon days of the late 70s when you could be blissfully unconcerned about your personal safety and that of your colleagues. This is because my health and safety is now paramount in the minds, or at least procedures, of many of my employers. Apparently, nothing is of greater import to them. Before I can step forth to even glance at a bird or lunge at a lizard I must show proof that I have undergone rigorous training and seemingly endless, repetitive and largely inappropriate inductions. Strangely enough, I am seldom asked for proof that I can actually identify fauna. The details of what transpires before I venture forth into the field could be a tome in itself, but let’s just deal with the field work. It is commonplace that I am obliged to wear a hardhat (even in treeless paddocks); high-visibility clothing (presumably so wildlife can elude me more easily); long-sleeved shirts with the sleeves buttoned at the wrist; long trousers; steel-capped boots; and safety glasses. I may be required to wear gloves, or at least have them hanging from my belt for ease and speed of deployment. I may not be allowed to carry a knife (let alone a gun), but I may have to carry a GPS (for my safety rather than recording the location of fauna), EPIRB, UHF radio, first aid kit, five kilograms of water, sunscreen, insect repellent and, albeit rarely, a defibrillator. Of course, I also carry whatever equipment I need to conduct the actual fauna work, which can be substantial. The decline in my lizard-catching skills during ‘herp searches’ would appear to be attributable not just to middle-age. In many instances the greatest risk I face to my health and safety is complying with health and safety procedures. No wonder I have a bad back. It is very unusual for me to be allowed out alone and, very occasionally, I have been forced to share my field work with paramedics to ensure it was safe. I know I have failed their standards at least once, because a colleague saw me in a subsequent presentation as an example of someone behaving unsafely. The practice of having supernumerary staff more likely to hinder than enhance my work reached its zenith recently when I was one of four field workers accompanied by up to 12 other people, most of whom didn’t leave the immediate vicinity of their vehicles and four of whom were occupational health and safety (OH&S) staff, who often argued with each other about what was and was not safe. That we were seldom more than 50 metres from a busy road or worksite didn’t assuage their touching concern for our welfare. This concern was so profound that, despite the stifling tropical heat and humidity, we were obliged to do warm-up exercises, in full PPE (personal protective equipment), including hardhat, to ensure that we started work suitably ‘warmed up’. Fauna surveys may become an extreme sport. It is often a requirement that I am breathalysed before starting work, either sporadically or daily, depending on my client’s procedures. For one project, a two-person OH&S team met me and my colleague in the field with a breathalyser. They included themselves in the random selection process to identify the sole testee. On most mornings one of them drew the short straw and was breath-tested by the other, before I was allowed to go about my work. I wasn’t tested in the field even once but nonetheless had to wait for this process to be completed. On two other projects it was unacceptable to urinate in the field, requiring me to travel up to 40 minutes to a designated toilet. These were both on working cattle stations where, presumably, the cattle were toilet-trained. Without bladder synchronisation, this rule meant a two person team would waste more than 2½ hours a day on a single toilet break each. No explanation was ever provided. Perhaps nappies should be added to my equipment. I have also found myself prohibited from using a crow bar to strike the ground when installing pitfall traps, because it was designated as only suitable for leverage. An excavation permit has been required before inserting even a small metal peg in the ground. I’ve not been allowed to change a flat tyre as this is an emergency situation requiring specialist assistance. I’ve been refused permission to climb into the tray of a ute to retrieve trapping equipment as I didn’t have a working at heights permit. I was told that the minimum height at which a working at height permit was required had been abolished. When I remarked that this meant we couldn’t get into or out of the 4WD I was met with the sort of look that suggested my card was being marked. I’ve been repeatedly denied access to sites at night for reasons that have never been adequately explained. Maybe they just intuited there was no nocturnal wildlife present. And staying on site, even in station dwellings, is often prohibited, if only because of complexities with gaining permission through the chain-of-command. This means that there are often significant distances to be driven between accommodation and the survey area. Companies often have default access procedures that make night work especially difficult to organise, make pre-dawn starts difficult and limit field time by imposing substantial breaks. I could go on, but you probably have the picture by now. So why is my whinging about work conditions appearing on an environment website? Some of the data I collect ends up in the environmental impact statements (EISs) that are meant to guide regulatory bodies when they approve or deny projects or set the conditions under which these may proceed. At least in theory, the data I do or don’t collect can decide whether a large development goes ahead, though it is more likely to influence approval conditions. But health and safety rules have become so burdensome that often I can no longer work properly. A development project that fails to achieve good ecological outcomes does not necessarily reflect the wishes of the consultants involved (please restrain your cynicism). In my experience, ecologists undertaking survey work have the best interests of the environment and its denizens at heart (that’s why they studied environmental science or something like it). And the environmental staff of mines and coal-seam gas companies invariably have green hearts. But all are potentially hampered by a very large number of constraints, mostly beyond their control. The constraints do not necessarily result in an EIS that fails to identify the key issues. A good consultant relies substantially on database searches and habitat quality assessment to determine environmental values and predict the presence or absence of threatened species. The write-up for even the most comprehensive field survey is likely to suggest that some species were present but not recorded. But government approvals for projects are much easier to get if rare species are predicted rather than demonstrated. Much of what I have described is comparatively recent to the industry and no one project I’ve been part of has included all these constraints. But the tape grows ever more restrictive, and I can envisage a future when it prevents fauna surveys altogether. The rules are seldom designed with fauna ecologists in mind. They instead reflect an inflexibility by companies whose typical activities on a mine, for example, are indeed hazardous and who take their duty of care seriously. I defy the comprehension of OH&S staff when, for example, I point out that venomous snakes cannot be held safely by someone even wearing thick gloves. There is a complete disconnect between the operation of a good fauna survey and fulfilment of OH&S policy. The government wants to reduce ‘green tape’ to speed up the decision-making process on development projects. They should at the same time encourage companies to abandon this nanny-state approach to field work, to free us from the OH&S tape that prevents us from properly surveying fauna and flora, and which increases costs to industry when OH&S staff spend their days trailing ecologists in the field. The health and safety of wildlife may depend on it. Note: This text was originally published at wildlife-australia.org and can be downloaded as pdf here. The picture says it all. We used to build hides to do ecosystem observation. Safety needs to be relevant to the context of the work being performed, not the mindless application of rules. Increasingly safety practice has removed itself from the operational context, and become a self streamed administrative function disengaged from purpose and quality of the work performed. As a safety professional I can’t help but share your frustration on an approach which is outdated as it is based on single-loop learning. The outcome of this type of approach is defensive, inhibited learning where existing theories are reinforced as would appear in your case. The profession has continued to evolve – the concept of ‘adaptive safety’ comes to mind which challenges the basis of rule based safety for sake of rules, and instead empowers individuals to evaluate rules to ensure meaningful outcomes and making sense of the spirit of the law. This form of organization learning is associated with double loop learning and deutrolearning, and asserts individual learning and organizational learning is intertwined. ( Argyris & Schon,1996; Waddell, 2011). I hear the frustration in your story Terry. Many mines and the companies charged with their development employ far too many mindless, box ticking, PPE cops. Who somehow believe in their own importance and fail to actually realise the true risk of the situation. I would only wish for the senior OH&S management staff at the locations you’re referring to could read this and understand rules don’t work in black and white. Terry, I also hear your frustration. 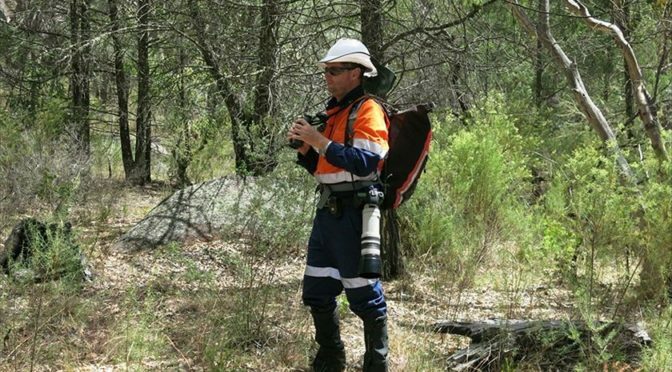 Being in the position of the Health & Safety professional assisting Enviro consultants negotiate the resource sector HSE requirements, I was always amazed how they made it so hard and expensive. We had a situation of 6 people going into the field for 1 day of enviro work on an exploration site and for the 1 day of work they had to do 6 days of inductions. like yourself they were all experienced field personnel, you can guess the cost yourself. I found the best way to negotiate these situations was to have a good risk management processes in place with all the paper work up front. The PPE cops thrived on it. We even managed to carry out electro fishing on one major mine site with only our guys in attendance. I know this is not really the forward thinking conversations presented in this forum but it does indicate what we have to deal with out there and how far we have got to go to get the balance right. erhmm.. unless there is a open pit with a long armed digger to the left or right of that pic, what the frell does the PPE have to do with the hazard? The full gaiters are about the only bit of that kit that is relevant. Hard hat? For Drop bears mebbe.. He should look like a bushwalker not a miner. Just as non tariff trade barriers are to exports, Miners WHS is to environmental responsibility? ?